SEATTLE--(BUSINESS WIRE)--Sep. 17, 2015-- (NASDAQ: AMZN)—Last year, Amazon introduced the first Amazon Fire TV, combining voice search that actually works, fast and powerful performance, and an open ecosystem to deliver the easiest way to watch Netflix, Amazon Video, HBO NOW, Hulu, WatchESPN, and more on your big-screen TV. Since launch, Fire TV has become the #1 best-selling Amazon device category, with Fire TV Stick quickly becoming Amazon’s fastest-selling product ever. Today, Amazon is making those best-selling products even better. Introducing the next generation of Fire TV—the new Amazon Fire TV with support for 4K Ultra HD, and the new Fire TV Stick with Voice Remote. The new Amazon Fire TV is available for pre-order today for just $99.99 www.amazon.com/fire-tv and will start shipping on October 5. Fire TV Stick with Voice Remote is available for pre-order today for $49.99 at www.amazon.com/fire-tv-voice and will start shipping October 22. Fire TV Stick is also still available for purchase for $39.99 at www.amazon.com/fire-tv-stick. Fire TV devices have the most channels, apps, and games of any streaming media player, and are the easiest way to enjoy movies, TV shows, music, and live TV from services such as Netflix, Amazon Video, HBO NOW, Hulu, WatchESPN, SHOWTIME ANYTIME, Sling TV, STARZ PLAY, ENCORE PLAY, NBC News, Prime Music, Spotify, Pandora, Vevo, Plex, A&E, YouTube.com, and more. Plus, the new Amazon Fire TV provides access to more 4K Ultra HD movies than any other streaming media player, with 4K content from Netflix, Amazon Video, and Prime Video. Already available in 4K are shows and movies from Amazon Video such as Transparent, Better Call Saul, American Hustle, and Amazing Spiderman 2, as well as shows and movies such as Narcos and Marvel’s Daredevil from Netflix. 4K Ultra HD is the next generation of entertainment and delivers a more realistic entertainment experience with 4x the resolution of 1080p. 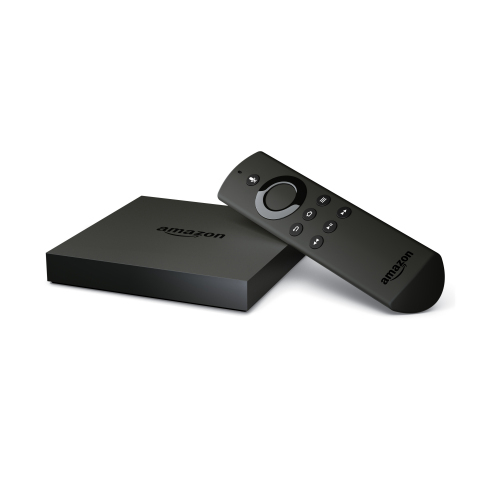 Amazon Fire TV is half the price of any other 4K Ultra HD streaming media player. With 4K support for Prime Video, Amazon Video, and Netflix, Fire TV also provides access to more 4K Ultra HD movies than any other device. Movies and TV shows already available in 4K include award-winning shows like Transparent, Better Call Saul, and Orphan Black, and blockbuster movies such as Captain Phillips, Men in Black 3, and Money Ball—with more being added regularly. The first Fire TV delivered industry-leading performance—now, Fire TV is even better, with 75% more processing power, and still less than $100. The new Amazon Fire TV has 5x the processing power of the latest generation Roku, and 8x the processing power of Chromecast. It comes packed with a MediaTek 64-bit quad-core processor, a dedicated GPU, plus 4x the memory of the latest generation Chromecast, and Roku. Fire TV features the latest standard in Wi-Fi technology—802.11ac MIMO—which gives you faster throughput and longer range for better performance, even if your router is located in another part of the house. In addition to the 8GB of on-device storage, Fire TV now offers expandable storage via microSD card slot for up to 128GB of additional storage for downloaded apps and games. Mayday Screen Sharing brings Mayday-powered customer service to the Fire TV streaming box, delivering 24x7, 365 days-a-year technical assistance—for free. When you call customer service by phone, the Amazon expert can remotely connect to your Fire TV—with your permission—to answer any questions you may have or to help troubleshoot. They can draw on the screen, walk you through how to do something, or do it for you—whatever works best. Gaming on Amazon Fire TV has been a customer favorite since launch, providing high-quality, low-cost options for the whole family. The all-new optional Fire TV Game Controller now includes voice search, an audio jack for private listening with Dolby enhancements, refined controls for a better gaming experience, and up to 90 hours of battery life without headphones. Plus, today Amazon introduced the new Amazon Fire TV Gaming Edition, which includes Amazon Fire TV, Game Controller, a 32GB microSD card, and two games—Disney’s Ducktales and Yacht Club’s Shovel Knight—all for $139.99. To read the press release about the new Gaming Edition, visit: www.amazon.com/gaming-edition-pr. Amazon today introduced another new member of the Fire TV family, adding a voice remote to Fire TV Stick—the fastest-selling Amazon device. Fire TV Stick is the most powerful streaming media stick available, and the new Fire TV Stick with Voice Remote is the only streaming stick with an included voice remote. The voice remote allows you to simply speak the name of a movie, TV show, actor, director, or genre and get results instantly—plus use the included voice remote on Fire TV Stick to ask Alexa for the weather, sports scores, traffic, music, and more. Last year, Amazon introduced voice search that actually works—no more hunting and pecking in an alphabet grid to find your favorite TV shows and movies. Now, the convenience of voice is getting even better on Amazon Fire TV with built-in support for Alexa, the brain behind Amazon Echo. With Alexa, Fire TV voice capabilities become even better—simply speak into the voice remote and ask Alexa for the weather, sports scores, traffic, music, and more. Alexa provides natural-language responses, combined with an immersive on-screen display, each time you ask a question on Amazon Fire TV. Just say “Alexa, play some jazz” to listen to your favorite music and simultaneously view album art, song title, and more via the on-screen experience. Say “Alexa, when do the Seahawks play?” to find out when the next game is on, or say “Alexa, how’s the weather tomorrow?” to see if you need to bring your umbrella and simultaneously view the five-day forecast on your big screen TV. Plus, coming next year, use Alexa to find and play TV shows and movies, navigate Amazon Fire TV, launch apps, and more—simply speak into the voice remote and say “Alexa, resume Star Wars;” “Alexa, search for drama movies with Matt Damon;” or “Alexa, play Hunger Games: Catching Fire.” Alexa integration will roll out to all existing Fire TV and Fire TV Stick customers via a free, over-the-air software update. Since launch last year, Amazon Fire TV selection of channels, apps, and games has grown by 17x, with over 3,000 apps now available. Customer favorites on Fire TV include Netflix, HBO NOW, WatchESPN, SHOWTIME ANYTIME, HBO GO, Hulu, STARZ PLAY, ENCORE PLAY, YouTube.com, Spotify, Pandora, AT&T U-verse, and Tennis Channel Everywhere. New channels and apps coming soon include FOX NOW, FXNOW, Poker Central, and Turner Classic Movies. Fire TV integrated universal search from the very beginning, and customers have loved being able to easily search across multiple services, including HBO GO, Showtime, Hulu, STARZ PLAY, ENCORE PLAY, and Vevo. Plus, Amazon will be adding over 10 services to universal search by the end of the year, including A&E, HISTORY, Lifetime, and PBS. Now you can watch the big game, breaking news, and more, live and on-demand on Amazon Fire TV—all you need is the internet. With Fire TV, you have access to a variety of live and on-demand video and TV apps such as HBO NOW, Sling TV, NBC News, Tennis Channel Everywhere, and more. With a subscription to Sling TV, you have access to live and on-demand content from channels like ESPN, CNN, TBS, HGTV, and AMC. With Prime Video, Prime members get access to thousands of movies and TV shows, including Transformers, Wolf of Wall Street, Anchorman 2, The Americans, Justified, and Downton Abbey, at no additional cost. Plus, get access to award-winning Amazon Original Series programming like Transparent and Tumble Leaf, as well as new shows coming this fall—which will all be available in 4K Ultra HD. With Prime Music, Prime members can listen ad-free to over a million songs from artists like Mumford & Sons, Daft Punk, P!nk, Bruno Mars, Blake Shelton, The Lumineers, Bruce Springsteen, and Madonna—plus, coming early next year, listen to top, curated Prime Music Radio Stations on Fire TV. Use Prime Photos to get unlimited storage for photos, and access them on Fire TV devices to play slideshows or choose a favorite album for the screensaver. Say It, Watch It with voice search that actually works—Simply speak the name of a movie, TV show, actor, director, or genre into the remote on the Amazon Fire TV, the all-new Fire TV Stick with Voice Remote, or the Fire TV Voice Remote App on Fire TV Stick. No more hunting and pecking in an alphabet grid. Instant streaming with ASAP—No more waiting for movies and TV shows to buffer. ASAP (Advanced Streaming and Prediction) is now 40% faster on the new Amazon Fire TV, so videos start instantly. ASAP predicts which Amazon movies and TV episodes you want to watch and buffers them for playback before you even hit play, so there’s no waiting. Instantly find out who that actor is—X-Ray for Movies and TV Shows is available directly on the TV screen using Amazon Fire TV and Fire TV Stick—simply click the Fire TV Remote and get instant access to actor biographies in the scene, trivia, soundtracks, and more, on tens of thousands of movies and TV episodes. X-Ray for Movies and TV Shows is exclusive to Amazon Video and powered by IMDb—the #1 movie website in the world. Simple to set up and easy to use—Arrives pre-registered so you can simply plug it in and start streaming in minutes. Screen sharing and display mirroring—Tap the “fling” icon on your Fire tablet to send video and audio to your big screen, or fling services like YouTube, Spotify and Netflix from your Android phone or iPhone. Or, share whatever is on your small screen—including movies and TV shows, music, and photos—with everyone in your living room using display mirroring, which includes support for Fire OS and Android, and devices from Motorola, LG, and Google. Personal photos and videos—Play slideshows and choose a favorite album for the screensaver on Fire TV devices. Photos or videos you take via phone or tablet can be automatically uploaded to Amazon Cloud Drive, making them accessible on Fire TV devices. Whispersync—Amazon’s Whispersync technology saves and synchronizes your Amazon video and music library across all Amazon devices. Start watching a movie on an iPhone with the Amazon Video app, or on a Fire tablet, and pick up where you left off on Fire TV. Watch on hundreds of devices—Buy a movie or TV show from Amazon Video and watch it on hundreds of devices that are compatible with the Amazon Video app, including iOS, Android, and Fire OS devices. 1-Tap Archive—Automatically backs up your Amazon digital content in the cloud so you never need to worry about losing content. Top-rated, world-class customer service—When you shop on Amazon, buy a Fire TV device, or buy digital content from Amazon, you are also getting Amazon’s world-class customer service. Free month of Amazon Prime—Amazon continues to invest in bringing Prime members new movies, TV shows, songs, and books to enjoy at no additional cost. Prime members enjoy unlimited, commercial-free, instant streaming of thousands of movies and TV episodes with Prime Video, and unlimited photo storage in Amazon Cloud Drive. Eligible customers can get a free 30-day trial of Amazon Prime when they purchase an Amazon Fire TV or Fire TV Stick. Amazon Fire TV is available for pre-order starting today at www.amazon.com/fire-tv for $99.99 and will start shipping October 5. Fire TV Stick with Voice Remote is available for pre-order starting today at www.amazon.com/fire-tv-voice for $49.99 and will start shipping October 22. Amazon also introduced a Fire TV Gaming Edition—read the press release at www.amazon.com/gaming-edition-pr. Customers can also still purchase Fire TV Stick for $39.99 at www.amazon.com/fire-tv-stick. Amazon also today announced the all-new Fire tablet, Fire Kids Edition, and Fire HD 8 and 10. To read the press release about the all-new Fire, visit www.amazon.com/fire-pr; to read about the Fire Kids Edition, visit www.amazon.com/kids-edition-pr; and to read about the all-new Fire HD 8 and 10, visit www.amazon.com/fire-hd-pr.